The DNS feature included in Danube Cloud enables a simple management of DNS domains and records. In the upper right corner is a button labeled Show All, which can be used to display all domains, including domains that are not associated with the current working virtual data center. Name - DNS domain name. Public - DNS domain is usable by all users in this virtual data center. Private - DNS domain is usable by SuperAdmins, DCAdmins, and owners of this domain. MASTER - PowerDNS will use DNS protocol messages to communicate changes with slaves. NATIVE - PowerDNS will use database replication between master DNS server and slave DNS servers. Owner - DNS domain owner. DC-bound? - Whether a DNS domain is bound to a specific virtual data center. Records - Number of DNS records within a DNS domain and a link to DNS record management (read-only). A DNS domain can be created, updated and deleted only by a SuperAdmin. The default DNS domain (VMS_VM_DOMAIN_DEFAULT) cannot be deleted. Used for associating an existing domain with a virtual data center. Can be performed only by a SuperAdmin. A DNS domain can be only used when attached to a virtual data center. Used for removing an association of a domain with a virtual data center. Can be performed only by a SuperAdmin. Name - The name of the DNS record - the full URI the DNS server should pick up on. Type - DNS record type. One of: A, AAAA, CERT, CNAME, HINFO, KEY, LOC, MX, NAPTR, NS, PTR, RP, SOA, SPF, SSHFP, SRV, TLSA, TXT. Content - DNS record content - the answer to the DNS query. TTL - How long (seconds) the DNS client is allowed to remember this record. Enabled - If set to false, this record is hidden from DNS clients. Changed - The date and time when the record was last changed (read-only). 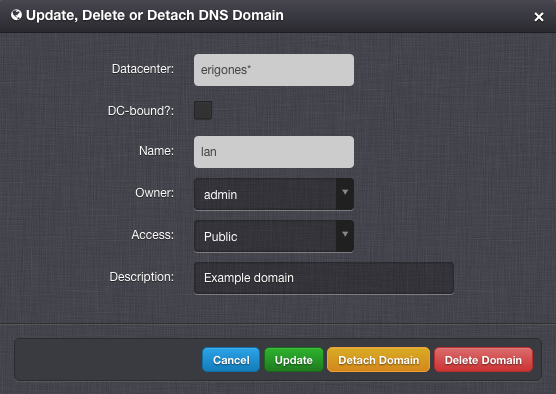 Custom DNS records can be created, updated or removed by a SuperAdmin or by a DnsAdmin (DC-bound domain only).